Futures Lab: Interest rate futures have unique attributes that traders and investors need to be aware of. 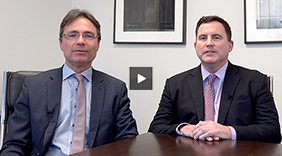 Robert Almgren and Christian Hauff of Quantitative Brokers explain. This article was written by Chidem Kurdas to convey a discussion by Robert Almgren and Christian Hauff, co-founders of Quantitative Brokers and specialists in interest rate futures execution. In the section on the role of information events, the article draws on a paper written by Haider Ali of Quantitative Brokers. With the ending of the Federal Reserve's quantitative easing program, interest rates are more likely to rise. Other central banks have already started to tighten monetary policy. On the other hand, continuing economic weakness would tamp down on rates. The uncertainty creates trading opportunities. But interest rate futures markets are complicated in their own special way, as this discussion shows. Dr. Almgren is a visiting scholar and adjunct professor in financial mathematics at New York University's Courant Institute, besides directing research at Quantitative Brokers. He was an associate professor of mathematics and computer science at the University of Toronto before moving to the financial industry. He headed quantitative strategies in Banc of America Securities' electronic trading services group. Mr. Hauff was also at Banc of America Securities, as head of electronic equity derivatives and e-sales for global rates, currencies & commodities. They started Quantitative Brokers in 2008 and went operational after a couple of years of work. Quantitative Brokers is the 21st century electronic version of the old floor broker who had expertise in a particular market and knew how to get the best price for a client. Quantitative Brokers does that via computerized algorithms, developed on the basis of detailed knowledge of interest rate futures markets. Here, Messrs. Almgren and Hauff discuss the distinctive features of interest rate contracts and how their strategies factor in those characteristics. US interest rate futures comprise various US Treasury and Eurodollar contracts. These have unique attributes that traders and investors in interest rate strategies need to be aware of. We discuss two key characteristics in the sections below-the impact of information releases and co-integration relationships between contracts. Eurodollar futures are cash-settled bets on the future of LIBOR paid on US dollars (not to be confused with the Euro-Dollar foreign exchange rate) and are widely used to hedge short-term interest rates. Treasury futures are a more traditional futures contract in which the deliverable is a US Treasury note or bond. These products constitute a very large and liquid market. While interest rate futures' particular features can make for pitfalls in trading, there are ways of using specialized market knowledge to minimize risk and achieve better trades. Market details are very important. Interest rate markets are driven by information releases, more so than equity markets. Scheduled events and public releases take place during the trading day. These have significant effects. For instance, Treasury auctions and statements by the Federal Reserve's Open Market Committee have a direct impact on Treasury futures. Announcements of economic data such as changes in non-farm payrolls and housing starts have implications for Federal Reserve rate setting and open market operations. 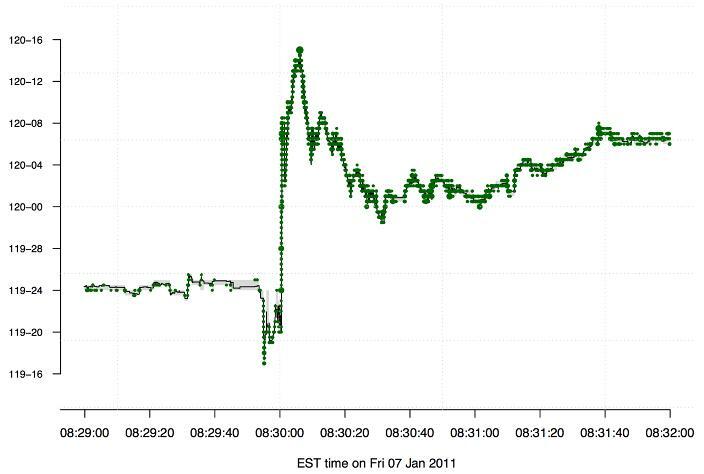 The data cause movements in Eurodollar and Treasury futures (see figure). Each dot represents market trades in the 10-year note Treasury futures contract. The market moves 24 thirty-seconds of a point in the space of 15 seconds in response to the payroll number at 8:30am EST. We track and analyze 62 distinct events. Our trade volume forecasts are calibrated to the effect of each data release. Because the releases are regularly scheduled, market participants can gear up in anticipation of the announcement and react to it. This leads to intriguing patterns in trading volume and price. Quantitative Brokers did a case study of the CME Interest Rate Futures Complex before and after the release of non-farm payroll and unemployment rate data from January 2009 to May 2011. The Bureau of Labor Statistics publishes this report on the first Friday of each month at 8:30 ET. The information may influence the Federal Reserve's policies. We looked at the effect on liquidity and bid-offer spread. Notably, the release causes a rise in price volatility and increases the risk involved in trade execution. This is about market behavior within a very short time frame, an area we have expertise in. Before the announcement, uncertainty about the information to be released causes market participants to withdraw from the market. Beginning 15 minutes before the data release, posted liquidity (inside bid + inside ask) across instruments shrinks. Thus liquidity in Eurodollar futures drops from approximately 5000 contracts 15 minutes prior to the release to 750 contracts one minute prior to the release. With the drop in liquidity comes a widening of the bid-offer spread. Eurodollar and Treasury futures trade in large ticks and in consequence under normal conditions tend to have a minimum spread. But in the run up to a release, the spread widens substantially. For instance, the five-year Treasury note future has a spread seven times wider on average at 8:30 ET on the days when a non-farm payrolls release is due, compared to regular days. Once the information is released, market participants come back and the ratio of traded volume increases to four or five times the usual volume. There is increased volatility just after the release as participants start trading. If you lack knowledge of such special patterns in the market, you may trade too much at the wrong time and at extremely wide spreads. This is just one sample of the specific effects of macroeconomic data releases. Our trade execution strategies incorporate many such features. The strategies do not trade at unfavorable times and prices, minimizing slippage to traders' benchmarks. One of our algorithms, called Strobe, is designed to keep to the target trajectory prior to the release of nonfarm payrolls data and will wait for the market to digest the release before re-entering the market. Interest rate futures, especially the contracts in the Eurodollar complex, are correlated. The Eurodollar complex contains some 40 contracts; of these, the front 12 quarterly contracts are the most liquid. These tend to move together, therefore you can co-integrate one quarterly contract with neighboring quarterly contracts to predict the price. We've introduced a co-integration model that monitors the prices of the front two years of the Eurodollar complex to look for short-term departures from equilibrium. It then generates a price prediction signal for each individual Eurodollar contract, which is dynamically updated throughout the trading day. The predictions are used in our trading algorithms' real-time order placement. To develop the co-integration model we analyzed the historical relationships among the prices of all the interest rate contracts. These relationships are highly dynamic, so we combine the co-integration signal with other short-term price signals to determine how to post a trade. This is a major competitive advantage for clients who trade Eurodollars. They can expect smarter execution and lower transaction cost. And it's timely. In the coming months, if interest rates start to rise with the end of QE2, there could be extreme volatility and speculation in the Eurodollar and volumes could grow a lot. We're doing research on how to apply the co-integration model to other highly-correlated contracts, including US Treasury futures. More broadly, interest rate futures trading has a bright future and presents great opportunity for algorithm creators. Systematic trading lends itself to systematic execution. High frequency traders already do this type of execution for themselves. We provide high-frequency trading execution to slow trading shops. We plan to expand to Europe because our clients trade on European futures exchanges. In addition, if options on interest rate futures become substantially electronically traded, that will be an interesting opening for options trading algorithms. We are also tracking the ongoing efforts, pushed by new regulation, to institute centralized clearing for interest rate swaps. This could be an entirely new area for electronic trading in the interest rate area. This article was published in Opalesque Futures Intelligence.